Thyme for Cooking Summer: Sausages with Tomatoes, Shallots and Onions. Put into 'grill pan' (a metal or foil pan dedicated to use on the grill) NOT a mesh grill pan. Cook over medium heat 25 minutes. 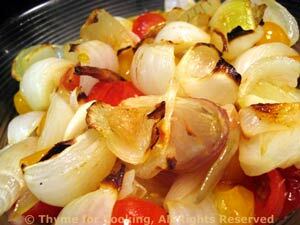 Cut tomatoes in half and add to shallots and onion. About 10 minutes into veg cooking time put the sausages on the grill (allow more time if they are fat). Grill until done. Whichever gets done first just move to the side off of the main heat and finish up. Remove all and serve. 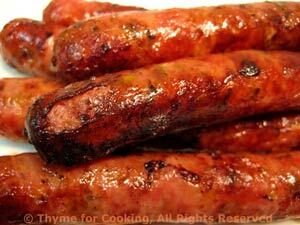 You can either add sausages after 10 minutes or sauté sausages in large nonstick skillet, browning well on all sides, then cover and continue cooking until done 4 - 8 minutes longer, depending on size (cut one open and look - shouldn't be pink).